I’ve always been partial to creative demos. Instead of taking a vertical slice of the game and letting you you play it out of context, the developer creates a unique scenario strictly for the sake of the demo. It lets players get a feel for the style of the game and the way it plays, but doesn’t spoil things or fail to make sense from a narrative context perspective. This is particularly true of narrative heavy games and visual novels. If you were to give someone a demo of a visual novel, either the early portion of the game would fail to build and show off the intensity of the scenario, and a slice from later in the game would give away too much regarding characters and story up to that point. I was skeptical of the Danganronpa V3 demo for this very reason. Hence why the team at Spike Chunsoft came up with a creative idea to show potential players what a full console Danganronpa can be without pulling from their main story. They created a unique demo scenario that will not be part of the final game as a way to let players meet the characters, wander the environment, see a gruesome character murder, and take part in a class trial with all the new mechanics coming to V3. They also allow you to take your save file from the demo and get exclusive items in the full game when it launches. If you’ve never played a Danganronpa game before, you should know that they are quite twisted but joyously engrossing. The themes revolve between hope and despair, though most often trending towards despair. Students at Hope’s Peak Academy are locked in a game of murder. It’s the Prisoner’s Dilemma amplified through 16 students that have no idea who they can trust. The proprietor of all this despair? Good old Monokuma, the sadistic black and white bear that relishes in seeing hope drained from the lives of the innocent and not so innocent cast of characters. I’ve reviewed the first two games—as well as the spin-off—and the despair only gets heavier with each iteration. In the demo, similar to the openings of both previous entries, Kaede awakens in the school that will presumably house the murder game for V3. It’s new to have a female protagonist for a main entry Danganronpa game, though Spike Chunsoft played with the idea through the bizarre third-person shooter spin-off, Ultra Despair Girls. Surprisingly, she is immediately greeted by Danganronpa’s first protagonist, Makoto. It’s a nice familiar call-back, something that I doubt will crop-up in the early moments of the actual game. The mystery that pervades Danganronpa means cards are held close to the chest on how one game relates or connects to another. Given free reign over a portion of the overgrown school, Kaede is given the chance to meet the rest of the Ultimates, each student being an expert at something that defines (or sometimes doesn’t) their character. It’s here that Kaede sees another familiar face, Danganronpa 2’s lead, Hajime. It’s a moment that provides a staccato note in the smooth harmony of meeting the new cast. Again, I don’t think it’s something we’ll see in the early moments of the full game. 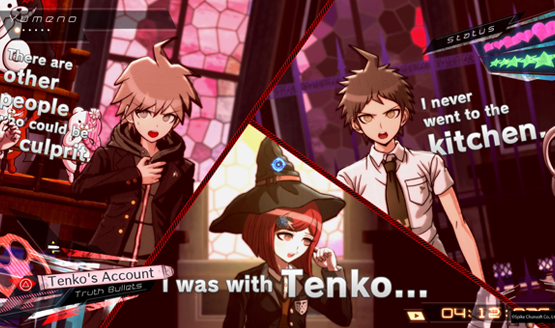 A number of comments are made throughout the scenario about Hajime and Makoto being the “previous protagonists,” not to mention references to this being just a demo. 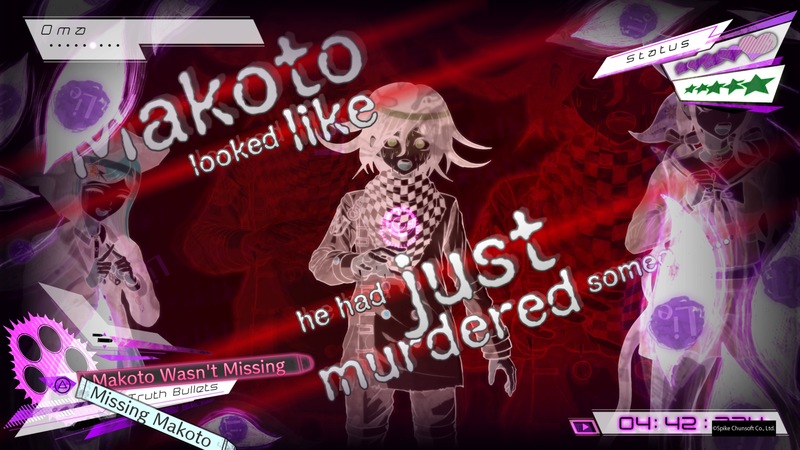 The investigation and class trial isn’t about the murder of a new character. Yasuhiro, the wild haired clairvoyant from the first game, ends up with a knife in his gut, and it’s your responsibility to figure out who killed him. After providing a demonstration of some of the new features coming in Danganronpa V3, such as lie bullets and rapid fire debates, the demo ends just as Kaede is beginning to understand what happened. Voice overs at the end indicate that Makoto, Hajime, and Yasuhiro were all just actors, possibly working with Monokuma, to show players the ropes for a new Danganronpa. It’s a curious conclusion, making me wonder if there are any hints or implications for the full game. Spike Chunsoft has always been wily in how they construct their stories. There are a number of anomalies not addressed fully in the Danganronpa V3 demo. Why even bother bringing them up at all if they aren’t going to have repercussions in the grand scheme of things? What may seem like just a silly scenario outside of the main narrative may actually hold numerous clues for Danganronpa V3. It’s an impressive showcase of how Spike Chunsoft took the Danganronpa formula and made it feel right at home on the PS4. It radiates style and gets me excited for the full release without spoiling the experience, which is precisely what a great demo should do. The Danganronpa V3 demo can be completed in under an hour, depending on how much time you take to explore and talk to the various characters, and whether or not you skip quickly through dialogue. If you plan on playing V3 when it releases, it’s worth it to take some time with the demo just for the exclusive items it will give in the full game. Being able to go into a mystery as complicated as Danganronpa with at least a bit of a jump start on getting to know these characters is well worth it too. Danganronpa V3 Killing Harmony will be available on September 26th for US audiences.